Though the Britishers left the nation, and India attained independence, one community whose fate remained locked and unchanged decades after decades, are the Adivasi community brought for working in tea gardens of Assam. They continue to remain under the grip of deprivation, humiliation and exploitation by the tea garden companies, their authority members and even the government. Besides numerous socio-political, economic, educational problems plaguing the community, the healthcare facilities remain one of the most important issues which are not adequately available in most of the tea estate hospitals in Udalguri district of Assam. Moreover, there is a serious lack of awareness among the tea estate workers on issues concerning health and hygiene. But amidst this there are certain organizations like the Assam Mahila Samata Society (AMSS), an autonomous society registered under the 1860 Societies Registration Act which has been putting efforts to change the scenario by empowering women through the tool of education. AMSS has been implementing the the Mahila Samkhya programme and the 1992 Programme of Action. These programmes are envisaged by the Policy on Education, 1986 and by the Union Ministry of Human Resources Development (MHRD) respectively. Talking to Northeast Now, an AMSS official requesting anonymity said that the tea garden workers were not provided with proper sanitation facilities and hence they lack a hygienic atmosphere. There are prevailing social barriers like child marriage, witch-hunting among the Adivasi communities and this may be attributed to lack of education. Their living conditions also result in several compulsions, which rob them of the capacity to think about anything beyond marriage. Maternal and infant mortality rates among the communities also remain all-time high. These may be attributed to early marriage, excessive physical labour, exposure to the use of chemical pesticides and fertilizers and a slipshod attitude among their male counterparts. As per a survey-based report prepared which assessed the healthcare scenario in 26 tea estates of various sizes of Udalguri district, the tea garden women are greatly deprived of proper maternity care. The situation has come to such a stage that the tea garden community women have accepted the prevailing condition of their life as a fait accompli. What is more worrisome is that they are not conscious about the expected delivery dates of their babies. They do not go for institutional deliveries and are not granted maternity leave. Cases are there when the tea garden women labourers deliver their babies while on plucking duty, said the AMSS official. Significantly, the tea estate community women are entirely working women and they are made to shoulder the responsibility of running their families too. However, they are very often subjected to violence, ill-treatment, discrimination and sexual harassment at workplace by lucrative offers from garden managers and are often addressed by vulgar and slang words by the managerial staff. What is least expected is the trade unions and student bodies which claims of working for the cause of labourers are allegedly hand in gloves with tea garden management. The trade unions have never raised any demand concerning the tea garden women labourers. 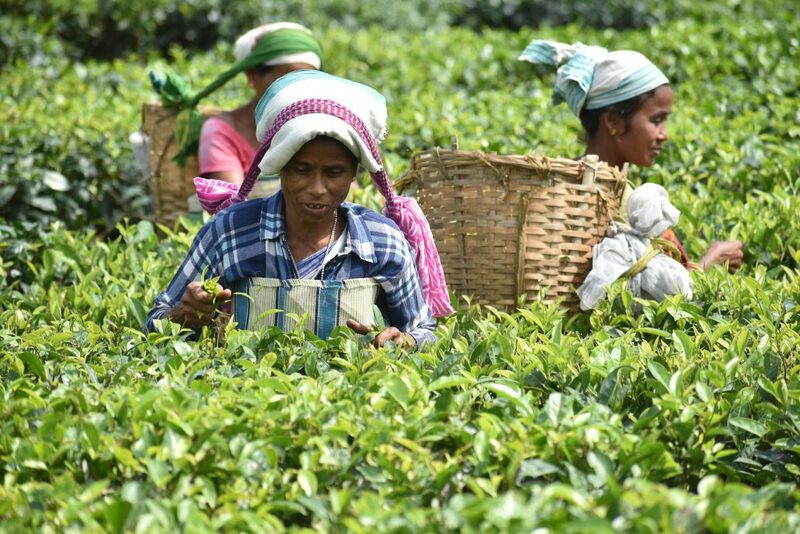 The government has also been adopting a step-motherly attitude towards the welfare of the tea garden workers, using them mostly as a vote bank. The tea estate workers’ life is such that they cannot opt for extending financial or physical support to any of the on-duty pregnant women. The worst sufferers are the woman casual labourers. There are also cases of discrimination against the women labourers, both regular and casual, in matters of wages. The growth in the number of small tea gardens has also kept alive the bane of school dropouts among these people all over the State. This is also encouraging the child labour system in the tea industry.